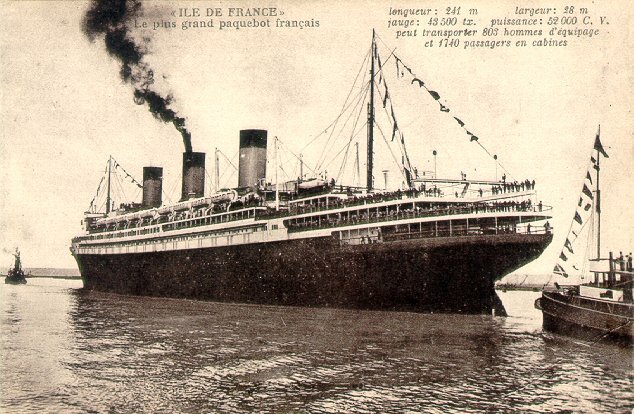 Like many of the French Line's great passenger ships, Ile de France was built by Chantiers et Ateliers Saint Nazaire. When she was launched in 1926, she was CGT's largest ship and the sixth largest in the world. 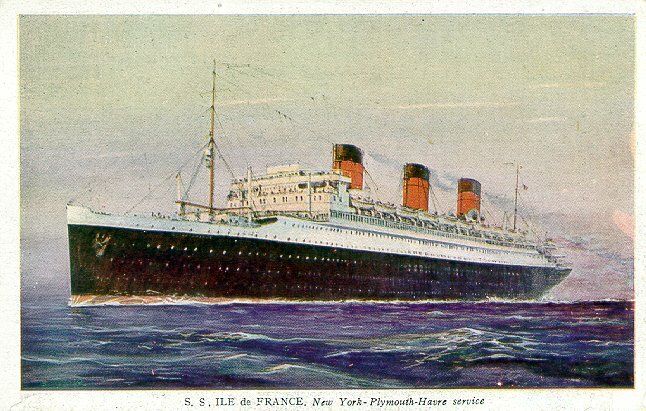 Her maiden voyage on 22 June 1927 was from Le Havre to New York by way of Plymouth. 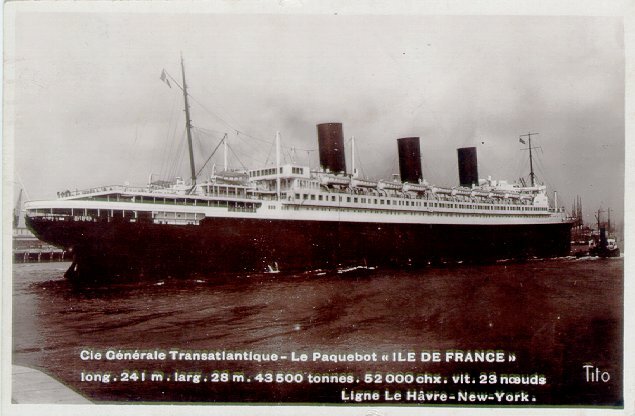 In July 1928, a seaplane catapult was installed at the ship's stern; beginning in August of that year, a seaplane took off when Ile de France was within 500 miles of port, to cut the mail delivery time by one day. This service ended in October 1930 and the catapult was removed. 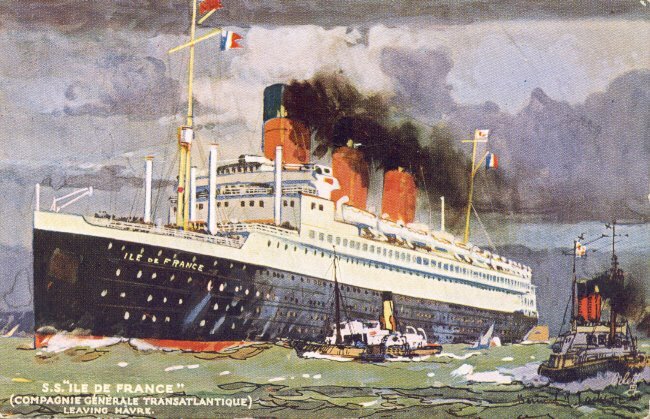 Laid up in New York when World War II began, Ile de France returned home, but to Marseilles rather than Le Havre, in May 1940 and was on a trooping mission to Indochina when France fell in June 1940. She was then taken over by the British and served as a troopship, under Cunard management, for the balance of the war. 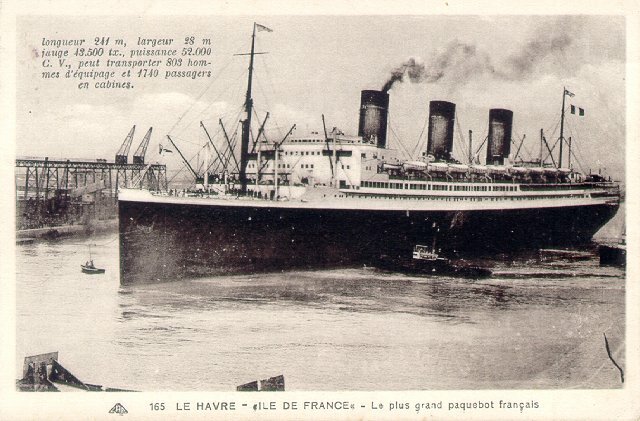 She reverted to French control (but still under Cunard management) in September 1945, and served another year as a troop and repatriation ship before being returned to CGT in February 1946. 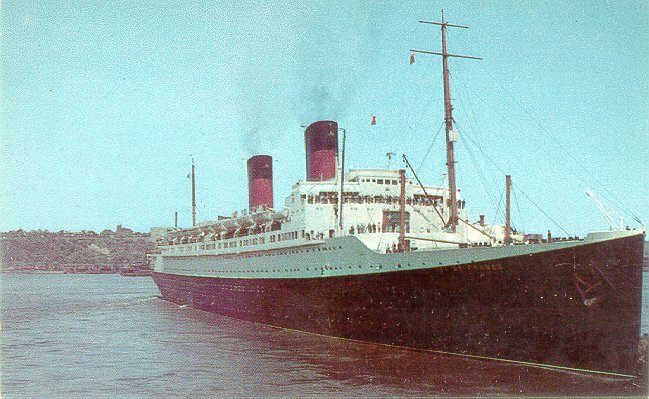 Her postwar career for CGT began in October 1946 on an austerity service from Cherbourg to New York. A two year overhaul was begun in April 1947. The most noticeable change was the reduction of her funnels from three to two. The last two cards on this page shows her as she appeared after this work was completed. 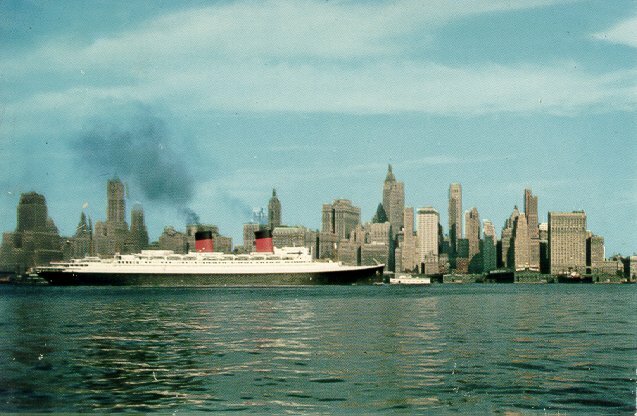 She returned to service on her old Le Havre-New York route in July 1949. 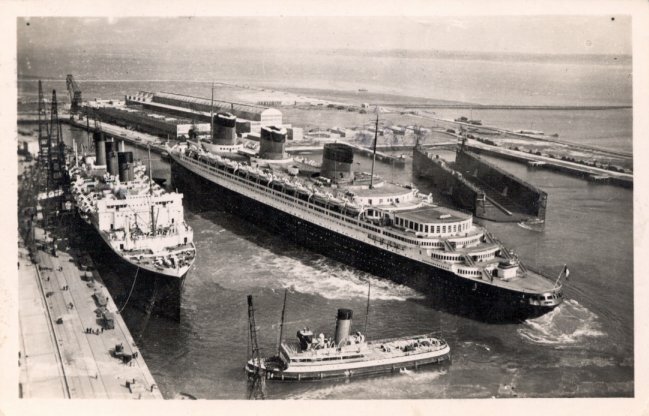 In 1956, Ile de France rescued some 750 of the passengers from Andrea Doria after he collision with Stockholm. Two years later she was laid up and then sold for scrapping in Japan. Renamed Furanzu Maru for the journey to Japan, she became a movie star on her way to the breakers, being used under the name Claridon in the movie "The Last Voyage". Once filming was completed, she was taken to Osaka and scrapped in 1959.